TP-Link's EAP330 products provide wireless coverage solutions for small-medium business. They can either work independently as standalone APs or be centrally managed by the EAP Controller software, providing a flexible, richly-functional but easily-configured enterprise-grade wireless network for small and medium business. “Celling lamp” appearance and easily mounting design with chassis make the EAP330 easy to be installed on a wall or ceiling and blend in with most interior decorations. The EAP330 can be powered via a PSE* device or the provided power adapter. With the built-in dual-band antennas module, the EAP330 operate at both 2.4GHz and 5GHz, and apply 802.11ac standards and MIMO technology, allowing packet transmission at up to 1900Mbps. *PSE: Power Sourcing Equipment, a device (switch or hub for instance) that will provide power in a PoE setup. Powerful Hardware Ensures Excellent Performance Excellent Wi-Fi Performance for Business Environments Broadcom enterprise-class chipsets offers outstanding enterprise-grade performance, resulting in longer spans of stable operation and larger client capacities. "The EAP330 is packed with business class features." "TP-Link's Auranet EAP330 is well suited to updardly mobile SMBs. It provides an affordable, secure and high-performance wireless network, and the EAP Controller software is a class management act that offers scope to grow your network - without having to budget for an expensive subscription." The Omada EAP245 by TP-Link provides a business-class wireless network solution that’s flexible, manageable, secure, and easy-to-deploy. Featuring cloud access, Omada Cloud Controller OC200 or Omada Software Controller allow users to centrally manage the entire Omada networks in the remote site. And the intuitive Omada app makes network management incredibly convenient. Omada EAPs also feature captive portal and advanced RF management functions, which make them ideal for demanding, high-traffic environments such as campuses, hotels, shopping centres and offices.. Build and manage a scalable Wi-Fi network for your business with the Omada business class solution, tailored to handle the power of hundreds of TP-LINK EAPs at an affordable cost. Superior Wi-Fi Speeds and Performance QCA enterprise class chipsets, dedicated high-power amplifier and professional antenna along with the latest generation 802.11ac Wave 2 MU-MIMO technology, ensure superior 1750 Mbps Wi-Fi speeds and long-range coverage over 2.4GHz and 5GHz wireless bands. Free Cloud Centralised Management - Anytime, Anywhere Omada Cloud Controller OC200 and Omada Software Controller make it easy to manage and monitor the whole Omada network in real-time, while cloud service enables remote and secure access no matter where you find yourself. Easy Management with the Omada App Follow configuration instructions on the free Omada app to get set up in minutes. Omada lets you configure settings, monitor the network status and manage clients, all from the convenience of a smart phone or tablet.. Guest Network with Facebook and SMS Support Captive portal helps maintain only authorised guests to use the network, presenting devices with a convenient, user-friendly authentication method to grant Wi-Fi access. The addition of SMS and Facebook authentication simplifies the captive portal even further to simplify connectivity and boost your business. Multiple PoE Options for Easy Installation EAP245 supports both 802.3at PoE and Passive PoE power supply, can be either powered by a PoE switch or the provided PoE adapter. The addition of elegant appearance and simple mounting design for easy attachment to a wall or ceiling further makes deployment effortless and flexible. Meet the New OC200 Cloud Controller The OC200 Omada Cloud Controller is dedicated to provide centralised management for the whole Omada network. The Omada EAP225 by TP-Link provides a business-class wireless network solution that’s flexible, manageable, secure, and easy-to-deploy. Featuring cloud access, Omada Cloud Controller OC200 or Omada Software Controller allow users to centrally manage the entire Omada networks in the remote site. And the intuitive Omada app makes network management incredibly convenient. Omada EAPs also feature captive portal and advanced RF management functions, which make them ideal for demanding, high-traffic environments such as campuses, hotels, shopping centres and offices. Superior Wi-Fi Speeds with MU-MIMO Technology Outfitted with the latest 802.11ac Wave 2 MU-MIMO technology, the EAP225 easily delivers dual-band Wi-Fi speeds of up to 1350 Mbps to multiple devices at the same time. Timesaving and Flexible Deployment The Omada EAP225 is designed for easy installation on any wall or ceiling. The Power over Ethernet (PoE) function allows your network cables to carry electrical power so you minimise on cable clutter. It’s one more hardwiring hassle you don’t have to worry about when operating your centralised management system. The Omada EAP115 by TP-Link provides a business-class wireless network solution that’s flexible, manageable, secure, and easy-to-deploy. Featuring cloud access, Omada Cloud Controller OC200 or Omada Software Controller allow users to centrally manage the entire Omada networks in the remote site. And the intuitive Omada app makes network management incredibly convenient. Omada EAPs also feature captive portal and advanced RF management functions, which make them ideal for demanding, high-traffic environments such as campuses, hotels, malls and offices..
Timesaving and Flexible Deployment The Omada EAP115 is designed for easy installation on any wall or ceiling. The Power over Ethernet (PoE) function allows your network cables to carry electrical power so you minimise on cable clutter. It’s one more hardwiring hassle you don’t have to worry about when operating your centralised management system. 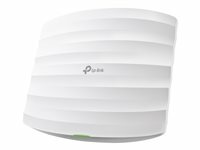 The Omada EAP115-wall by TP-Link provides a business-class wireless network solution that’s flexible, manageable, secure, and easy-to-deploy. Featuring cloud access, Omada Cloud Controller OC200 or Omada Software Controller allow users to centrally manage the entire Omada networks in the remote site. And the intuitive Omada app makes network management incredibly convenient. Omada EAPs also feature captive portal and advanced RF management functions, which make them ideal for demanding, high-traffic environments such as campuses, hotels, shopping centres and offices.. Perfectly Formed The EAP115-Wall would blend seamlessly into any business setting with a refined, minimalist appearance. A slimline design includes casing that’s just 11 mm in thickness. Effortless Deployment With 802.3af Power over Ethernet supported there’s no need for additional wiring. Simply plug in existing Ethernet cables and you’re ready to go. Complete Wireless Coverage An EAP in each room guarantees a strong wireless signal and allows guests to enjoy their own private Wi-Fi network. Easy Management with the Omada App Follow configuration instructions on the free Omada app to get set up in minutes. Omada lets you configure settings, monitor the network status and manage clients, all from the convenience of a smart phone or tablet. Omada provides a business-class wireless network solution that’s flexible, manageable, secure, and easy-to-deploy. Featuring cloud access, Omada Cloud Controller OC200 or Omada Software Controller allow users to centrally manage the entire Omada networks in the remote site. And the intuitive Omada app makes network management incredibly convenient. Omada EAPs also feature captive portal and advanced RF management functions, which make them ideal for demanding, high-traffic environments such as campuses, hotels, malls and offices..
Three Ethernet Jacks, One PoE Outlet More than just a wireless access point, EAP225-Wall acts as a switch and provides three standard Ethernet jacks together with a Power over Ethernet outlet, capable of powering wired devices such as IP phones, IP cameras, intercoms and more. Effortless Deployment With 802.3af/802.3at Power over Ethernet supported there’s no need to install additional wiring in the building. Simply plug in existing Ethernet cables and you’re ready to go. Complete In Room Wi-Fi Coverage An EAP in each room guarantees a strong wireless signal and allows guests to enjoy their own private Wi-Fi network. Gigabit Wi-Fi Speeds with MU-MIMO Technology EAP225-Wall delivers combined dual-band speeds of up to 1200Mbps. Armed with the latest 802.11ac Wave 2 MU-MIMO technology, it can exchange data with multiple clients at the same time to allow more devices to connect without any slowdown to the network. Omada provides a business-class wireless network solution that’s flexible, manageable, secure, and easy-to-deploy. Featuring cloud access, Omada Cloud Controller OC200 or Omada Software Controller allow users to centrally manage the entire Omada networks in the remote site. And the intuitive Omada app makes network management incredibly convenient. Omada EAPs also feature captive portal and advanced RF management functions, which make them ideal for demanding, high-traffic environments such as campuses, hotels, shopping centres and offices. The OC200 Omada Cloud Controller dedicated to provide centralised management for the whole Omada network. Monitor statistics in real-time, view a graphical analysis of network traffic, create a captive portal, upgrade and reboot your system, and easily scale your network to boost your business.